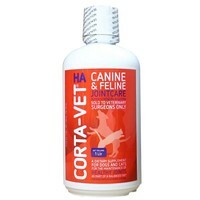 Corta-Vet HA Canine & Feline Jointcare Supplement is a complementary supplement for both cats and dogs to aid and support healthy joints. A unique formulation of the smaller key active isolates of Chondroitin and Glucosamine fortified with Hyaluronic Acid, Corta-Vet targets the normal wear and tear of the joints and helps keep them lubricated and as healthy and supple as possible. Use Corta-Vet as part of your pets daily routine to support healthy joints for life.